The Inventor of Coca Cola was John Pemberton. He created the formula in a three-legged brass kettle in his backyard. 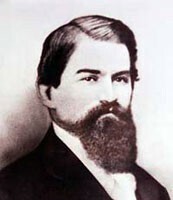 John Pemberton worked as a pharmacist in Atlanta, Georgia. When he created the Coca Cola formula, he needed a name for it. His bookkeeper, Frank Robinson had great penmenship so he was the first to script Coca Cola into the famous flow of letters today. Doctor John Pemberton died in August 1888. Coca Cola was first sold to the public at the soda fountain in Jacobs Pharmacy in Atlanta on May 8 1886. Sales for the first year were 50 dollars. It cost over 70 dollars in expanses so the first year of sales were a loss. Until 1905, the soft drink marketed as a tonic and contained extracts of cocaine as well as the caffeine rich kola nut. In 1887, another pharmicist, Asa candler, bought Coca Cola from John Pemberton for 2300 dollars. By the late 1890s, Coca cola was one of the most popular fountain drinks, due to Candlers aggressive marketing of the product. In one period of time, Coca Cola was a drug for headaches. When they started charging taxes for medicine, Coca Cola was brought back to just a beverage. Coca Cola started out with no bubbles at all. Someone accidentally added carbonated water into the syrup instead of regular water. People liked it better that way. Delicious and Refreshing! That was the first official slogan. People saw how famous Coca Cola was and tried to copy them-king cola, cola ree, gay-ola, cold cola, and candy cola. Coca Cola wanted to stay original so they changed the glass they served the beverabe in from staight to the classic curvy cup. People also made up the nickname " coke" because saying "Coca Cola" would take too long. When Candler sold Coke to ernest Woodruff for 25 million, his son, Robert winship Woodruff, took over and was elected president of the coke company. In 1920, Coke was sold in vending machines. Coke was also the first soft drink sold at the Olympics. In 1950, Coke made choices of 10, 12, and 26oz bottles. In 1960, Fanta was invented from Coke. Sprite was invented a year after. The elf-like man who wore a bottle cap was called the sprite man. The Diet Coke was made in 1982.